During last night’s State of the Union address, President Obama stressed the urgency of reinstating the Emergency Unemployment Compensation program for long-term unemployed workers, which, in an unprecedented move, Congress allowed to expire last month. This federal program typically provided a maximum of 28 weeks of additional benefits to workers who lost a job, through no fault of their own, and had exhausted their regular state benefits but were still unable to find work. With the program’s expiration, more than 1.5 million jobless workers have already stopped receiving aid and more than 2 million more will exhaust their benefits by the end of this year. Laid-off workers will now lose any support after only six months, the maximum duration of unemployment insurance benefits in most states. 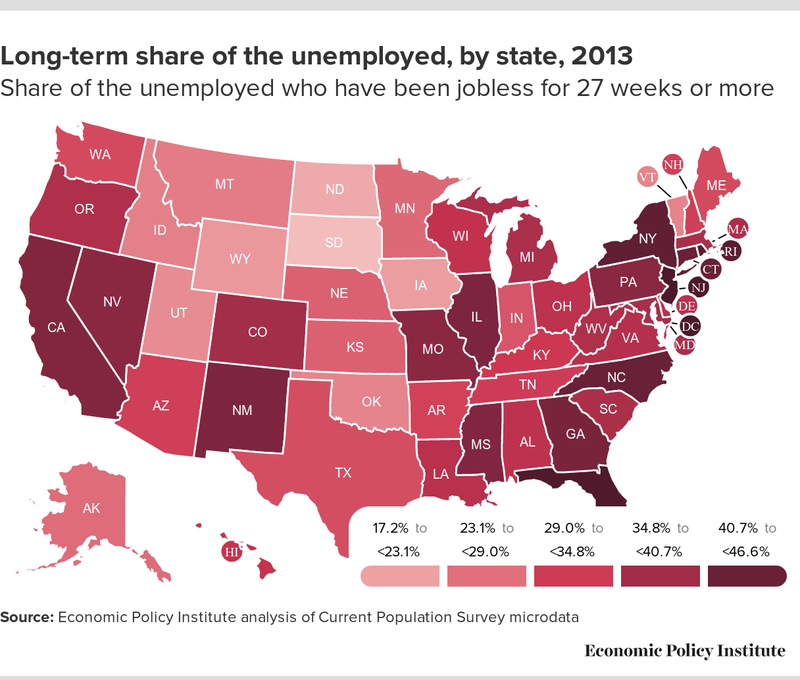 The map below shows the share of the unemployed who have been jobless for six months or more in each state. There are 28 states, plus the District of Columbia, where more than a third of the unemployed have been jobless for six months or more. In New Jersey (46.6 percent), the District of Columbia (46.6 percent), and Florida (46.2 percent), nearly half of the unemployed are long-term unemployed. With long-term unemployment still at record levels, Congress’ failure to renew this program is shocking; long-term unemployment benefits have never been cut off before with long-term unemployment so high. The highest the national long-term unemployment share ever reached prior to the Great Recession was 26 percent in June of 1983. Currently, there are 41 states (plus the District of Columbia) with long-term unemployment shares above 26 percent. This interactive feature is not supported in this browser. Please use a modern browser such as Chrome or Firefox to view the map. Click here to download Google Chrome. Click here to download Firefox. Click here to view a limited version of the map.